Prison, USA – A week into what’s expected to be the largest prison strike in United States history and word of mass strike participation is percolating outside the walls. Thousands of inmates in the world’s most jailed country are predicted to stop working, stop eating, participate in sit-ins, and boycott for-profit services to draw attention to what many call an exploitative and abusive system of modern slavery in the U.S. prison system. Direct actions, blockades, noise demos, call-ins, and networks of solidarity from people outside prison walls seem to have grown across the U.S. in the last couple of years, supporting prisoners and uplifting their voices. On August 21, the first day of the 2018 Prison Strike, about 50 people, accompanied by a marching band, shot fireworks off the Juvenile Detention Center (JDC) in Minneapolis, Minnesota while incarcerated youth looked down at banners reading “End Prison Slavery“, “Fire to the Prisons“, and “Stillwater to Attica, Support Rebel Prisoners“. Two days later, on August 23, Unicorn Riot covered a noise demonstration in Boston where over 100 protesters gathered to show their support for the prison strike. There are 31 states in the U.S. with a higher incarceration rate than entire countries. In turn, a growing movement for prison reform and abolition has been budding across the U.S. since the 2016 Prison Strike, which was the largest in history with over 24,000 prisoners from 24 states that participated. The list of struggles inmates face is dynamic and long. Big issues mentioned by organizers include forced prison labor, poor living conditions in prison, the cost and availability of communication with the outside world, visitation rights, and more. WHY A PRISON STRIKE & WHY THESE DATES? The 2018 prison strike started August 21 and lasts until September 9, based on symbolic dates. August 21 is the date of Soledad Brother, Black Guerrilla Family founder and former Black Panther George Jackson‘s assassination during his attempted escape from San Quentin prison in 1971. August 21 is also the date of the start of the Nat Turner slave rebellion in 1831. The month of August has history as well; it was essentially the organizing in West Coast prisons from George Jackson and other militant black radicals that paved way for the moniker ‘Black August’. Since the violent events surrounding several escape attempts and other prison incidents in the early 1970s, prisoners have resorted to many ways of honoring the sacrifices that members of the Black Panther and Black Guerrilla Family made. This year’s prison strike was prompted in large part by the horrific conditions that spurred a deadly riot in South Carolina’s Lee Correctional Facility in April 2018. Seven inmates were killed and dozens more wounded in the worst violence inside prison walls since the Lucasville Uprising of 1993. In a lengthy and informative interview with incarcerated members of Jailhouse Lawyers Speak inside the Lee Correctional Facility from investigative press organization Shadowproof, the mainstream narrative of the violence at Lee is picked apart and the conversation brings to context a lot of the current struggle behind bars. Many inmates believed corrections officers in Lee purposely created the conditions for people to be murdered. Another major reality that prisoners face is that some facilities force inmates to work, often for free or for meager pay of just a few cents per hour. Chattel slavery was abolished by the 13th Amendment, but slavery itself was not. The 13th Amendment explicitly allows slavery “as punishment for crime” and is the legal framework upholding the current system of prison slavery in America. The organizers of the 2018 Prison Strike are incarcerated members of Jailhouse Lawyers Speak, a national organization that provides legal support to fellow prisoners, as well as other imprisoned representatives and members of a variety of other organizations, such as the Incarcerated Workers Organizing Committee (IWOC), a project of the labor union Industrial Workers of the World (IWW). 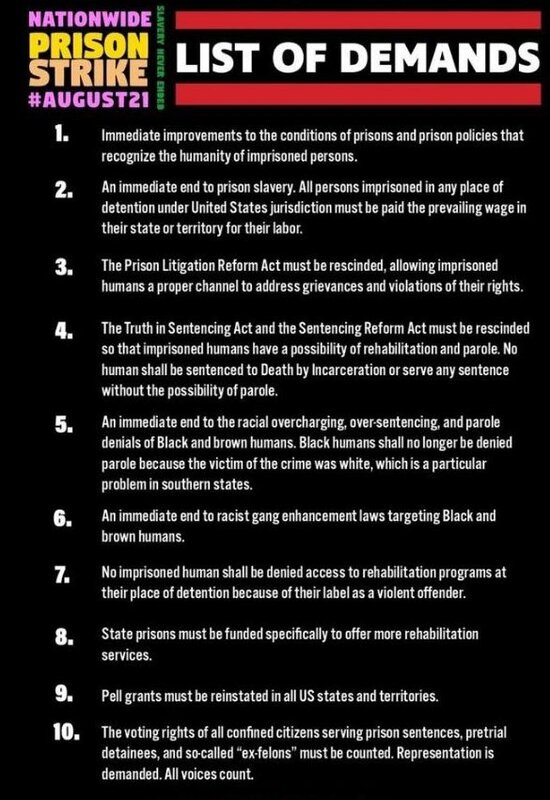 Although each state, each prison, and even each individual prisoner has their own set of issues, there is a list of 10 demands from the nationwide strike. Bailey hinted that the demands are pushing people to rethink prison abolition as a solution as opposed to reform. A lot of conversations and opinions have sprung up around recent prison strikes, bringing to question the best ways forward.